1970s Modern Ceramic Art Vase Signed by Eimers F.
Beautiful crazing glazed ceramic vase titled "Simple Vase" by American artist Walter Yovaish, 1975. Very important Mid-Century piece. Glazed pottery vase by Swedish American artist Rolf Key-Oberg, 1900-1959. Very cool midcentury metallic glazed sculptural vase with protruding male and female figures. Artist unknown. 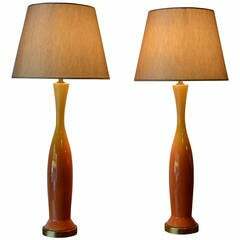 Exceptional pair of ceramic glazed table lamps. Awesome height measures at 30 inches. Yellow to orange ombré. Professionally rewired. Shades not included. Early work by Wayland Gregory, patterned gold leaf on white ceramic with bright green exterior, signed, 1940s. Generous size. 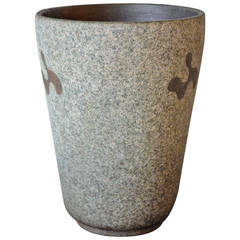 1970s modern ceramic art vase signed by Eimers F. It has a deep organic feel thanks to the rough finish and splashes of white over turquoise.